For a second successive week, Tayport will be playing in the Thornton’s Property East Region League Cup with a trip to Downfield on the agenda this weekend. 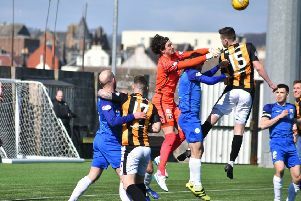 In the three-team section, which also includes last Saturday’s opponents, Lochee Harp, ‘Port really must win to have a chance of progressing from their group. The Canniepairt men lost their home tie against Downfield last month and defeated Harp last week. Downfield have won both of their matches and a win on Saturday would see them top the group. Canniepairt boss Stevie Kay, who added new signings Conrad Courts and Harris Kay to his squad this week, is hoping his side can build on the positive 4-1 win over Harp on Saturday. He said: “We were three goals up in 16 minutes and started on fire. “Conrad Courts comes into the team and starts playing the kind of balls you’d expect from somebody with his experience. “Connor Ireland puts us 1-0 up and then the second comes from an interchange between two 19-year-olds. “Jamie Gill gets us number three after picking up the ball and scoring. With so many young players in the Tayport side, Kay admitted that the form was likely to be “indifferent” from time to time, but challenged his young players to step up to the mark. “We have so many young players that, by the time they get to 23-24-years-old, and if we keep the squad together, then I think they can achieve things and make a decent name for themselves. And that young side can only be helped by the experience of new signing Courts who joined the club from Kelty Hearts. “Apart from the quality and experience he’ll add we were needing someone who can play left back,” said the manager. “He’s a player who can run a game and keep the ball. Tayport are hoping their tie will be played on Saturday but there is a doubt about the playing surface at Downfield Park. Ironically, last weekend’s game against Lochee Harp was supposed to take place at that venue, as Harp are ground-sharing with Downfield this season. The match, however, had to be switched to the Canniepairt, as the pitch was unplayable. That was only an option, as the teams two had not met, either home or away. As Tayport and Downfield have already played on the Canniepairt, such a switch would seem to be ruled out this weekend. Check Tayport’s Twitter and website for updates.